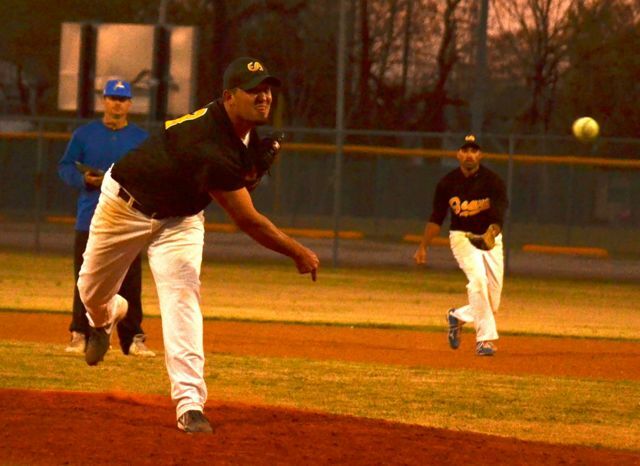 HOUSTON � After some rough games early in the Pecos Spring League, the Las Cruces Vaqueros finally played what coach Casey Dill said was the team�s best game all season: a 10-4 victory over Garden of Gears. For Mesa coach Bill Moore, the problem was simple. 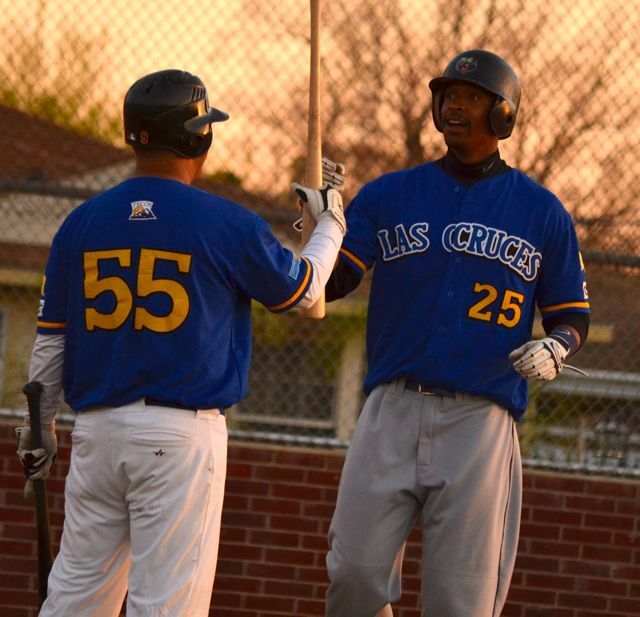 After the Gears went 1-2-3 to open the game against Jeff Goulet, Mesa starter Brandon Jordan got the first two Vaqueros before Carl Johnson sent a smash over left center, putting Las Cruces up 1-0. But Mesa took the lead in the second. Zach Kreeger was hit, D.J. 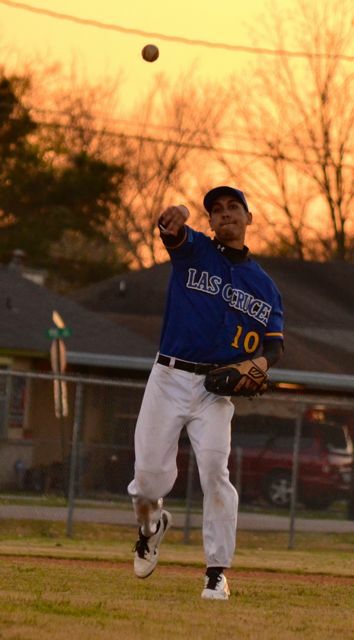 Johnson and Chris Carrera each singled � Carrera scoring Kreeger � then after a balk, back-to-back ground outs by Jeffrey Traver and Dwayne Starks scored Johnson and Carrera. 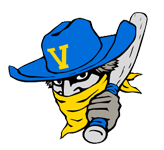 But the Vaqueros came back strong in the bottom of the second, scoring four runs, three coming off a home run by Edison Alvarez after a leadoff double by Adam Ziegler and a walk to Blake Babnick, and the fourth on a walk to Goulet and a single by Johnson. Goulet put two Gears on base in the third but got out of the inning unscathed, then Las Cruces added four more runs in the sixth off reliever Yoshimune Tsujii, who walked five of the seven batters he faced along with a single. After hitting the first batter he faced � forcing in a run � Dwayne Starks got out of the inning. The Vaqueros tallied seven runs, led by Alvarez who was 3-for-3 with 5 RBI and two runs scored. Johnson was 2-for-4 with 2 RBI and one run scored and Babnick was 1-for-1 with three runs scored. The Gears had five hits off five different players. Starks had the best Mesa pitching performance, Moore said, and despite the lack of offense, wasn�t displeased with that. Garden of Gears will take on the winless Sea Lions Friday, while Las CRuces will try to hand the Apollos their first loss. Edison Alvarez is congratulated by Effrain Garcia after a home run. Dylan Stone (left) and Bryce Babnick combine to get Kyle Zimmerman out. 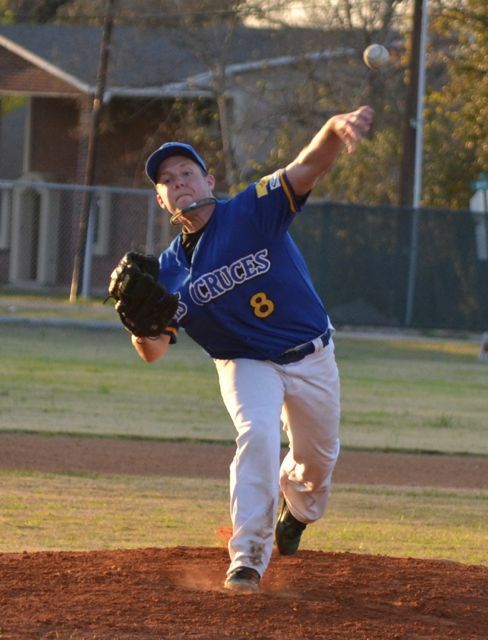 Jeff Goulet got the win for Las Cruces. Brandon Jordan started for Garden of Gears. 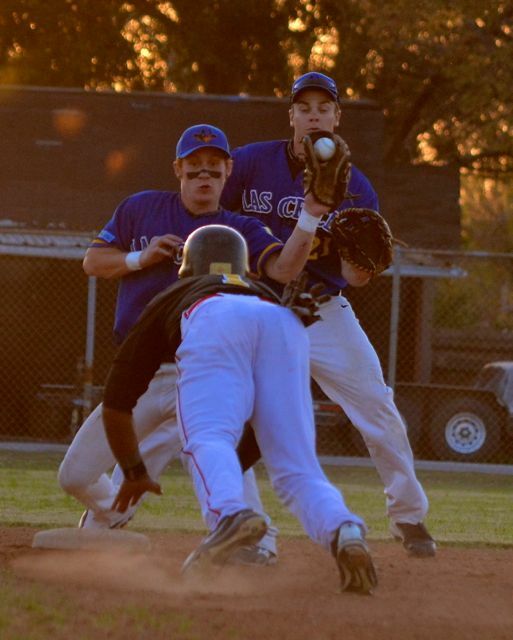 Jacob Alastra makes the throw from third.